I seem to be in a roll with movies these days and one of them is ALONG WITH THE GODS: The Two Worlds. I watched at the advanced screening in Ayala Malls Vertis North this morning and I couldn't keep my excitement over it. You see, the trailer alone had me wanting to watch this because it's all over Facebook, aside from that I love watching one of the main actors named Cha Tae-hyun in 2days 1 Night, My Sassy Girl, The Producers (and I'm not even a fan in this state lol). This Korean flick though was released last December in the US already, and I'm sure pinoys have been eagerly awaiting it's showing here. It's a fantasy drama flick, so you get a lot of advanced techinal computer graphics done by pretty excellent people from Korea, and a combination of pretty good actors in the mix. The story delves on their belief that in the afterlife, a person's soul is judged 7 times in a span of 49 days. 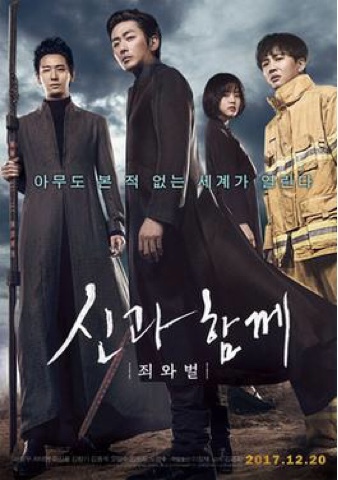 Tae-hyun plays Kim Ja-Hong, a firefighter who's destiny starts an honorable death, one that impressed people in the afterlife as he saves a person from a burning buiilding. He died saving a young girl and got a rank of honorable paragon. He has to go through all those judgements first in order to go and be reincarnated. The judges are different gods which have tasks for him to continue to the other, he has 3 guardians who will act as his counsel, and that's where the adventure begins. Watch his story unfold as he gets the chance to be reincarnated and get the chance to fulfill his last wish to finally meet his mother in her dreams. That's the only way he could see and communicate with her for one last time. If you want to watch this movie, it's showing in major malls nationwide and is distributed locally by Viva Films. Trust me, if you love Korean movies... you'll add this on your list after you watch it. It's that goof!